The Print Center’s Annual International Competition is one of the oldest competitions of its kind. 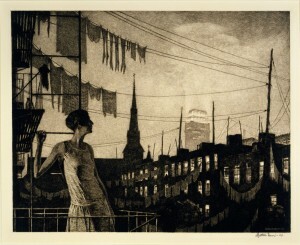 The first Annual Exhibition of American Etchers was held in 1924 and subsequent competitions in the early years focused on other print processes, including block printing and lithography. The competition is now open to all artists using photography and/or printmaking as critical components in their works, and each year we invite renowned colleagues to serve as jurors. Through the competition, hundreds of artists have gained exposure and a significant number of artworks have been added to the Philadelphia Museum of Art’s permanent collection, including this exquisite etching by Martin Lewis.